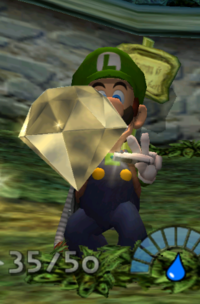 Gold Diamonds are found in Luigi's Mansion, worth 20,000,000G each, which is most of any collectible in the game. They are significantly larger than Silver Diamonds and Red Diamonds. Gold Diamonds are found in two spots. In the first one, Luigi must water a plant three times in the Boneyard (where Spooky resides): once when he first sees it, once after defeating Bogmire, and once after defeating Boolossus to make the now-flower bloom, revealing the diamond and several other treasures. The other can be found if Luigi captures all 50 Boos (not counting King Boo); the last Boo drops the Gold Diamond. If Luigi captures the final Boo and saves, the Gold Diamond's location is saved as being on the ground. Therefore, if players don't save using a Toad after obtaining the Gold Diamond, the Gold Diamond will be lost if the game is turned off or Luigi dies and, since the game saved after the final Boo got captured but before the Gold Diamond was obtained, the Gold Diamond disappears and cannot be obtained again. This page was last edited on October 13, 2018, at 10:34.